New Hanukkah Inflatable.....Large Brown Hanukkah Bear Holding Star Of David. This very adorable and handsome Brown Hanukkah Bear decked out with his Yamaka will be the talk of all your Hanukkah Celebrations. This Hanukkah Bear Inflatable stands 7.5 Feet Tall and lights up for a glowing night time display. New for Hanukkah......6 Foot Dreidel Light Up Hanukkah Inflatable Decoration. 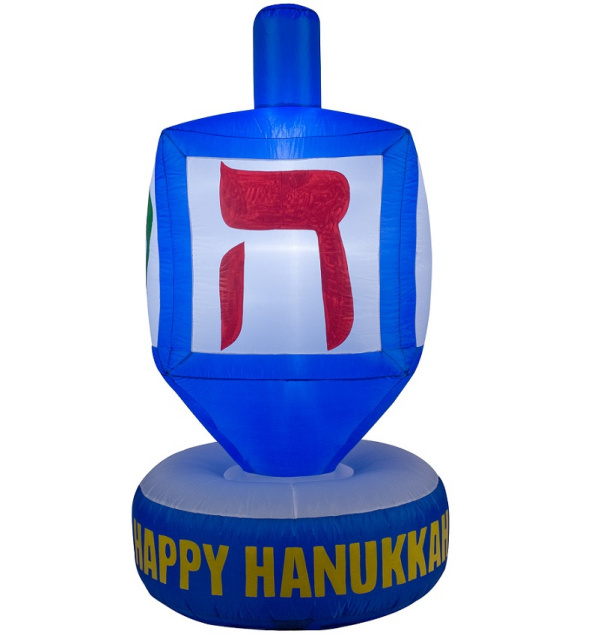 Celebrate the Hanukkah Festival Season with this Colorful Lighted Dreidel Inflatable. You will greet all your visitors with one of the Joyous Symbols of Hanukkah. Six feet high. Grab one today! Let this very adorable 2 foot Chenille Hanukkah Bear decoration be a part of your 2018 Hanukkah Indoor or Outdoor Decorations. Pre-Lit with 60 clear lights. Back for 2018....Delight your guest with this beautiful lighted Menorah Inflatable. Each candle in the Menorah features internal lighting that will brighten up your yard or home to help celebrate Hanukkah. Bring the Holiday Of Lights to your yard, school, or shul. Great for indoor or outdoor use to brighten your Hanukkah celebrations! Stands 7 feet tall. New Hanukkah Decoration...Very Adorable Blue Driedel Inflatable. Celebrate Hanukkah with the Family this year with this Blue Hanukkah Vinyl Dreidel. Stands almost 2 feet tall. Does not inflate by motor. Guaranteed to generate some festive smiles. New for Hanukkah 2018...... LED Light Up Menorah Decoration. Attractive and Elegant Looking Battery operated LED light-up Menorah decoration. Measures 4.5 "
New for 2019....3 Foot Bear Holding Dreidel Hanukkah Inflatable Decoration. This Dapper looking Hanukkah Bear with Blue Yamaka and Dreidel is ready to celebrate with you the festival lights. Lights up to create a night time illumination. At 3 feet tall, this Gemmy Hanukkah Decoration can be used on your porch, indoors, outdoors, or in your yard. 7 Foot Hanukkah Dalmatian Puppy Inflatable. Celebrate Hanukkah with our adorable eye catching 7 foot tall Dalmatian Puppy wearing a Yamakkah and holding the Jewish Star Hanukkah Yard Inflatable! The inflatable with bring holiday cheer to the neighborhood. Self inflates and easily sets up in seconds with the included heavy-duty fan, yard stakes, and stand and tethers. Suitable for indoor and outdoor use. Create a glowing night time display with the included internal lighting. Made of high quality durable nylon. New for Hanukkah 2018....11 Foot Chanukah Inflatable Bear. Supersize your Hanukkah decorating this year with this awesome looking jumbo Chanukah Bear holding a dreidlel. Great way to greet your visitors and guests for all your Hanukkah activities and celebrations. Kids and adults will love this one. Great for yard decorating as well as indoor festivities. New for Hanukkah...7 Foot Menorah Hanukkah Inflatable. 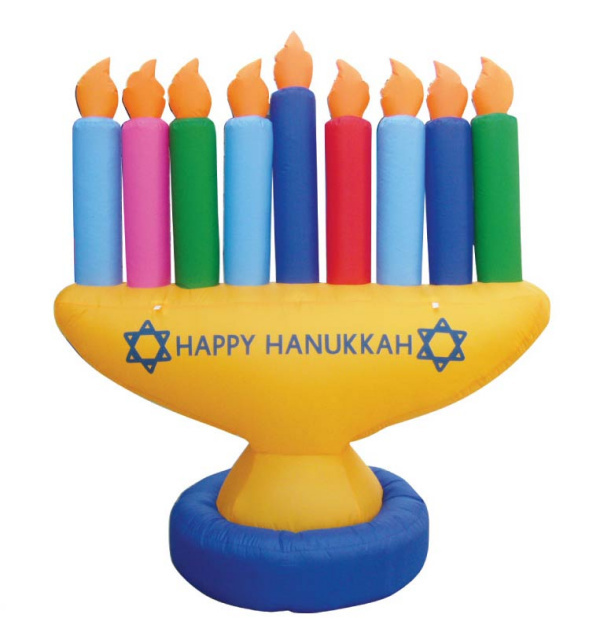 Celebrate the Festival of Lights with this colorful Menorah Inflatable. You will be greeting your guests Happy Hanukkah with this Menorah style Inflatable with the Star of David. This Hanukkah Inflatable stands 7 feet tall and lights up with LED lighting. Supersize your Chanukah Decorating with this 8 Foot Chanukah Inflatable. This eye catching Dreidel decoration is perfect for both indoor and outdoor use so you can either brighten your home school, or shul, or bring the Holiday of Lights to the streets. Celebrate the Hanukkah Season 2018 with the new Jumbo Dreidel Inflatable. New for Hanukkah 2018.....Large 11 Foot Hanukkah Menorah Inflatable This 11 Foot Menorah Hanukkah will surely raise your and your visitors Hanukkah spirit to celebrate the festival of lights. Brighten up your yard, school and shul, and other festive locations with this very colorful Menorah during the days of Hanukkah 2018. New for Chanukah 2018....Large 8 Foot Bear Holding Menorah and Dreidel Airblown. Very adorable bear positioned on a base with the banner "Happy Chanukah" This good looking bear is ready to help celebrate the festival of lights. And with internal lighting, this Chanukah Bear inflatable will help light up all your Hanukkah nights! This Hanukkah Inflatable stands 8 feet tall. Celebrate Hanukkah with this Large Heartwarming and Lovable Hanukkah Bear holding a Dreidel Inflatable. All guests, family, and friends will admire this Bear and can reflect on the meaning and significance of Hanukkah. Approximately 7 foot tall Airblown Inflatable! Comes with a powerful blower to inflate the Airblown and keep it inflated. Back for Hanukkah 2018....Large 7 feet Hanukkah Snowman Inflatable Holding a banner wishing everyone Happy Hanukkah. Brighten up the Hanukkah Season with this adorable Hanukkah Snowman featuring him wearing a Yamakkah and holding a Banner Greeting. This Snowman is definitely ready for Hanukkah and is ready to wish Hanukkah greetings to your visitors or neighbors. New Hanukkah Yard Art Decoration....3 Hanukkah Gift Boxes. Celebrate the Hanukkah Festival Season with these elegant and attractive Lighted Gift Boxes. Great for indoor or outdoor use. Great compliment to your other Hanukkah decorations to help light up the Hanukkah season. New for Hanukkah....6 Foot Tall Hanukkah Bear with Menorah Inflatable. Adorable and heartwarming Bear will help highlight the joy of the Hanukkah Season. Are you hosting a party this Hanukkah, are you preparing your child's class party, this "Chanukah bear holding the Menorah" will be the highlight of it all. New for Hanukkah 2018....Hanukkah Theme Globe Inflatable. Wish your visitors and neighbors Happy Hanukkah this Hanukkah Holiday Season with this 5 foot Hanukkah Globe Inflatable. Features several symbols of Hanukkah inside the globe. New Hanukkah Inflatable....Gemmy Four Foot Bear with Dreidel Hanukkah Inflatable. At this height, this Adorable Hanukkah Bear is ready to help you celebrate Hanukkah indoors or outdoors. Bright and colorful 3.5 Feet Menorah Hanukkah Inflatable. Great Menorah for indoor our outdoor use. Greet all your visitors and neighbors Happy Hanukkah with this lighted Gemmy Airblown Inflatable. Back for 2018.....Star of David Hanukkah Decoration. This Beautiful Star of David Lighted Hanukkah Decoration will brightly light up the night with 50 embedded UL listed lights. This 36" Star will be a great way to commemorate and celebrate the Hanukkah Season. The Decoration can be used outdoors or indoors. New Hanukkah Inflatable for 2018....Adorable Large Hanukkah Bear Holding A Dreidel. 11 foot Attractive Hanukkah Bear will grab the attention of all your visitors and guests and will add to the joy of your Hanukkah celebrations. Hanukkah starts at sundown on Saturday December 1, 2018...so grab your Hanukkah Decorations today! New for 2018....Lighted Rope Hanukkah Menorah Decor. Hanukkah rope light decor in the shape of a Menorah with yellow flames. This 16" by 20" Rope Lighting Menorah would be great for home or business. New for Hanukkah 2017....Hanukkah Hologram String Light Set. Bright and colorful lights to celebrate the Festival of Lights. Multi use light set from window decor, to door mantle, to stair rail, to lighting up your children's bedroom. 10 lights including Stars of David, Dreidels and Menorahs. 9 Feet long. Can be extended by connecting 1 set to another. New for Hanukkah 2018...LED Flameless Hanukkah Candle. Very attractive Hanukkah candle to help celebrate the Celebration of Lights. Flickering effect adds a warm glow to the Hanukkah environment. Battery operated. This Hanukkah Wreath is a perfect gift for all those celebrating the holiday season. The Hanukkah wreath is handcrafted of Balsam Fir and decorated with silver tipped pine-cones, white holly berries, reindeer moss, silver holly, and a blue bow. This Wreath is the perfect gift for Hanukkah! Click on the link above for more details, and beautiful enhanced photo! The Blueberry Wreath, inspired by the blueberry fields of Maine, is perfect for Hanukkah and blueberry lovers alike. The Blueberry wreath is handcrafted of Balsam Fir and decorated blueberries, pinecones, white holly berries, and reindeer moss, berries, pinecones, white holly berries, and reindeer moss.